Back in the early 1980s, the GTP-style prototypes were still in their infancy, and the JLP Racing team - John Pauls, Sr. & Jr. - wanted to build a new version of Porsche's 935 that could "win any race it entered" with no expense spared. Hiring the workshops and aerodynamics masters at Fabcar to build their new machine, the JLP-4 was the result. Developed concurrently with Porsche's 956 factory prototype program, the 935 shared many of the same philosophies. Fabcar's Dave Klym set his head engineer, Lee Dykstra, to the project, and this full aluminum monocoque Porsche (plus tube-construction rear engine housing) is the result. With advanced ground effects aero and a huge 3.2-liter turbocharged flat-six mounted as far forward as a "rear engine" can be mounted, this is essentially a GTP car masquerading as a Group 5 car, and we love everything about it. Allegedly, this Porsche's 3200cc engine is capable of around 840 horsepower at around 20.5 psi of boost, giving this aero monster big power as well. 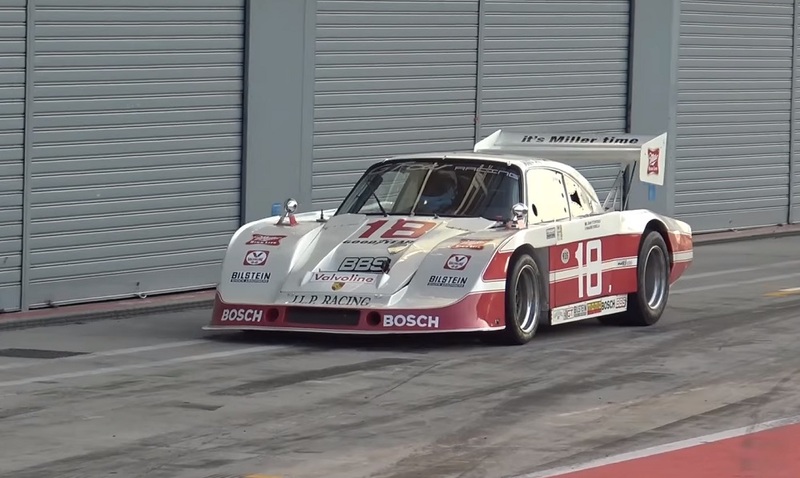 At the time, GTP cars had much less power from smaller displacement engines, giving this 935 a strange loophole to work with, and giving it the ability to win races outright, rather than battle for class titles. The fact that this massive powerhouse only has to move about 2200 pounds makes it all the more impressive. You'll notice that this Porsche features a very prototype-esque slab-sided center section. This was to allow for sliding skirts that sealed the Porsche's aero underneath the car, rather than spilling out the sides, making the huge rear diffuser more effective. The car also was reported to have switchable diffuser stalling flaps to increase top speeds on the straights. Far and away, this is the most sophisticated and aerodynamically advanced Porsche 911-based racing car of its time. Even the four-speed transmission was mounted upside-down in the chassis for a lower ride height and a better aero profile. This Porsche was recently hauled out by its owner for a track day at Monza, and there happened to be a pair of YouTube chaps (namely 19Bozzy92 and NM2255 Car HD Videos) there to capture the footage for all of us to enjoy. Both of these videos are quite short, at under five minutes, and admittedly they both have some overlapping footage, but it's worth watching both to see a few different angles of this monster of a Porsche-powered whatsit absolutely own the track. From the full-throttle flybys to the fire spitting overrun downshifts, we would be perfectly happy to watch this car blast the track for at least an hour or two. What a cool car, and what a cool experience to see it race on track. Pauls, Laniers, and Whittingtons almost destroyed sportscar racing in the US. AUSA should have thrown Paul Sr and Paul Jr in the Federal pen for life. Maybe a woman would be a live today if he did. Lanier should still be in prison and doing his best prison wifey imitation. The Whittington brothers should still be in prison. Both got off way to easy. IMSA was lucky to survive these scum bags. It did barely. Still lots of jokes at IMSA races, track days, and Porsche and BMW Club drivers schools about certain drivers having no visible means of support. Way over the top, Over reaction. None of us are saints including the accusers above. The Big Guy upstairs will judge us all, not a fellow man. The Whittingtons, Pauls, and Randy Lanier financed thier motorsport passions by smuggling pot…. I wear an IMSA T shirt fairly regularly and Often times I bring up the “old” joke of what it stsnds for….BFD. Everyone gets a laugh at it as we stand track side, still in our driving suits. I think I’ll paint my 911 track car baby blue with yellow acccents with a JLP RACING windshield banner.